Copyright © 2002-2011 SQUARE ENIX CO.,LTD. All Rights Reserved. 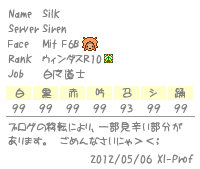 Copyright © 2006-2011 きまぐれ☆ねこの FFXI & XIV 日記. All Rights Reserved.